The title of “Downfall” is inspired by John Gilpin’s tragic 1970 photo of a boy falling to his death from the wheel well of an aeroplane, so it’s no surprise to find that Iranian sound artist Tegh’s ‘noisy ambient’ album is a bleak and barren affair. Cold synth pads play slow minor patterns (like a very depressed Moby) while different colours of noise growl and curve across your hearing. At times the noise, a sort of hybrid of guitar distortions and white noise, swamps you- at other times, there’s wide and near-empty space. There are no track titles, just five numbered parts that (with one exception) segue into one another to make a continuous 43 minute work. The first part plays almost like the imagined descent of the boy in the photo, but only the peaceful part; windy, reflective, but tactfully never impacting on the ground. The second part brings a more intermittent and tuned feel to the distorted electronics, like a musical Tesla coil, before the arrival of a surprisingly conventional organ-esque pattern that’s bordering on house piano. Part III is also organ-infused but as a beautiful calm series of pitched hums that’s borderline beautiful. Part IV is similarly structured but with evolving synthetic choral tones that unashamedly recall Part I. Part V layers the organ sounds into something both soft and cacophonous at the same time, before a surprisingly abrupt ending that is, sadly, probably the impact we thought we’d avoided at the start. Whilst there’s melancholy firmly rooted in the DNA of this work and it seems an intentional attack on your heartstrings, there’s a steady calm in it that’s quite engrossing. It’s surprisingly successful and definitely an indicator that Tegh is somebody to keep an ear open for. One of the funniest release that recently got pushed by the excellent Discrepant imprint comes from Vicki Bennett - the wise woman behind the moniker People Like Us -, whose sonic art is in between the collagism of plunderphonics masters like Negativland and that kind of cruelty you could expect in an imaginary nightmare where you find out that God is, in reality, the clown of McDonald. This release consolidated the amazing aesthetics she built over years by a plenty of radio broadcasts, releases on CD, DVD and vinyl, gallery exhibitions and online streaming, focused on amazing intersections of folk and popular sketches that she wisely uses like patterns to be knitted in a way that triggers memories or deeper (sometimes hazy or even gloomier) thoughts. The collages by which Discrepant filled "Abridged Too Far" tend to focus and give voice to the sardonically hilarious side of her production, so that your daydreaming while listening could be crowded by nihilist hypnotists coming to a sermon in between Swiss cows ("Nothing"), merry celebrations between bizarre freaks and former members of sinister carnivals and drunk yodelers ("The Doody Waltz") or those same yodelers being chased by exasperated gunslingers ("Abridged Too Far"), alien baby monsters born after a romantic night by Frank Sinatra (singing "I've Got You Under My Sing" some seconds before spreading his seed) and Doris Day (singing "Que Sera Sera" after she got pleased) whose crying results into a messy jumble of Hawaiian sonorities and salsa/rumba rumbling ("I've Got You"), a bug in the firmware of HAL9000 following the conversion into mp3 of old Dolly Parton's tunes ("Dolly Pardon"), really funny music-driven controls at the gate of some imaginary airport ("Nobody Does") and many more. Focus on the amusing details Vicki used to stitch in his collages, and you'll understand why people like her are so rare and precious for contemporary music! Highly recommended! On paper, you might assume an album structured from old Nintendo game sounds and 1990’s-era VSTs would be cheeky chiptunes- but this Durán Vázquez album is nothing of the sort. ‘Hikikomori’ is social reclusion and while the atmosphere here is insular, and isolated, this isn’t the sound of somebody playing computer games. This is tense drone soundscape work- beatless, hollow, resonant, drawn-out synthetic tones with washes and twinkles. The work has two sides, LP-style. On the first side, there are five tracks, four of which share the same name, “Solus Ipse”. The first of these has a glass-like wailing tones at the top end are so harsh that they are sometimes painful, telling you this work won’t function as an ambient chillout affair, the second introduces gradually crescendoing notes of tension and confusion. The third is more mellow, with distant string-like ebbs and occasional fragile percussive sounds. Brief interlude “Koroshiya” brings a hint of ethnic flute tonality, before the final “Solus Ipse” revisits the earlier disquiet. The second side is a single 26-minute work, “Segunda Natureza (trebón, paxaros, electrostática)”, where the retro-chiptune sounds are really heard. This is mostly a more playful piece, still essentially a drone base but lighter, with arpeggio patterns, 8-bit-style percussive moments and occasional single-step bass notes akin to having somebody in the next room playing a classic NES. Moods do shift throughout, with some sections more sombre and the latter sections more sparse, but this piece manages to feel both more unique and more inventive. It’s an album of two halves in which the second half is more recommendable than the first, but overall it’s a noteworthy take on the solitary drone soundscape form. On “La Niña Junco”, Federico Durand deliberately limited himself to using one single synth- a vintage Crumar Performer- along with a couple of effects units, and that’s it. The result is an album with a staggeringly pure and simple tone- bell-like gentle melodies bubble softly over ebbing fragile tone loops throughout. This is forty minutes of consistently mellow and unchallenging prettiness. As such, distinctions between tracks are subtle. “Melodia de felpa” has a slightly lullaby tone and “Rondel” has a bubbly closeness, while “Navidad en el bosque” feels more sparse and open, like standing in an empty cathedral with a synthetic organ. The strumming-like “Lluvia de estrellas” is a relaxed landscape, again underpinned by bubbles which fade supremely slowly as the album closes. It’s simple, it’s spacious, and it’s elegant. With the softness playing against rapidly oscillating effects it has a slightly retrospective, faintly Radiophonic Workshop feel to it. It doesn’t command your attention, but if it gets your attention, you’ll appreciate it. The first thought about this new Szymczuk’s release is the evidence of how this release seems mainly influenced by Kosmische Musik but, at a deeper analysis, it reveals a more complex net of influences; it's inspired by dreams and his musical development is driven by synth and also it features a cover that can be modified by the listener that can change the color and shape of the heart of the female figure in the cover which wear eyeglasses as it was a symbol rather than a portrait of someone. The first track, "Chapter 1. Escape from Reality and Enter this World of Dreams", starts with a dreamy line of synth and it evolves in a second part based on rhythmic structure that is hypnotic while "Chapter 2. Dream of a Woman a Pig" is more varied so the synth are used to underline the development of the beat. "Chapter 3. Dream of a Wave and Rock" is more quiet and focused on the atmosphere while "Chapter 4. Dream of an Arab Omlette" is based on that sort of structure which is derived by Arab musical tradition and is as hypnotic as it's not repetitive. "Chapter 5. Dream of Five Sisters and Three Sheep" is based on the same structure but under the dub influence. "Chapter 6. Dream of the Mirror Stars" and "Chapter 7. 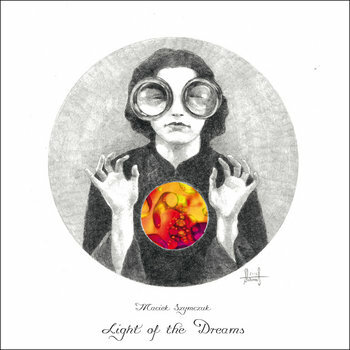 Dream of a Small Watermelon" are atmospheric track based on the careful choice of synth timbres. "Chapter 8. Dream of a Black Dog Called Antichrist" closes this release with a measured use of echo which confirm the aim of creating a dreamy atmosphere. The Pasonlini's quote 'Truth lies not only in a dream, but in many dreams” is expressed with the use of variations on the same which reveals a sense of form that put this release on a path of tradition and, so, it's a release that could be enjoyed by a wide range of listeners. A really nice work.